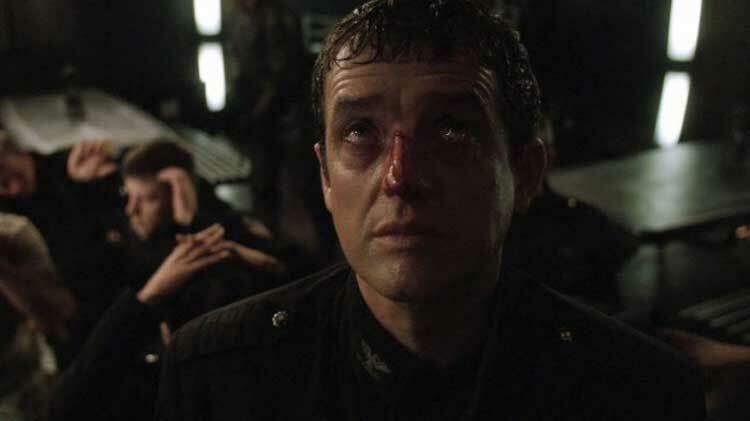 We’ve reached the end of SGU’s first season, which has evolved from a deliberately paced character study into all-out war. The time we spent understanding the crew in the beginning allows creators Brad Wright and Robert C. Cooper room to ramp up the pace now. The two-part finale clicks because we’re on board with the struggle. There’s no easy way out of the fight with the Lucian Alliance on the Destiny. Tricky plans go awry frequently, and not everyone will survive. It’s a classic way to end what’s become a fascinating series. The momentum carries so well from “Subversion” and excels when seen without commercial breaks. The ideal way to absorb “Incursion” is in one fell swoop. The tension barely subsides right up to the ominous final shots. It’s easy to compare “Incursion” to “The Siege”, the season finale of SGA’s first season. Both involve deadly assaults from outside forces trying to overtake the characters’ homes. The cliffhangers also feel similar in placing so many in jeopardy. There are quite a few differences between the two, however. We can look no further than the episode titles to observe the gap. On SGA, the Wraith invaders attack from the outside with massive external forces. Little hope exists for the Atlantis team, and there’s a fatalistic tone to their struggle. SGU looks inward and sets up a more personal conflict between Young and Kiva. The Alliance members aren’t evil, but Kiva’s team is taking no chances. Once the initial shooting subsides, their fight becomes a battle of mental wills between two committed adversaries. There’s a creative risk in spending too much time on set-up in a two-part finale. Let’s call it the Mockingjay, Part 1 syndrome. The first half must feel like a natural beginning and not just unnecessary padding. We need to feel the tension from start to finish. Thankfully, there’s no room for a breather here. The Alliance arrives on the Destiny 13 minutes into part one and doesn’t waste any time. This confident storytelling allows the events to flow naturally and not feel subservient to TV needs. We have enough time to appreciate the gravity of the situation and understand the key players. The enemies can’t be faceless automatons. We’re rooting for our favorite characters to survive, but the stakes only remain with capable opponents. “Incursion” begins with Young killing Telford (and reviving him) to save his friend’s soul. It’s a daring move that ends in success, but it could lose the bigger game. If Young had turned off the communications stones and pulled Rush out, he could have prevented (or at least delayed) the Alliance’s ability to reach the Destiny. On the other hand, that choice would possibly eliminate his only chance to save Telford. It’s a daring move but makes sense given Young’s lack of knowledge about the attack. It’s hard to cut him the same slack with his next major decision. The plan to vent the atmosphere in the gate room is callous but would have stopped the fight. That swift act wouldn’t win Young a humanitarian award, but it would likely save his entire crew. Circling back to Young’s choice with Telford, his plan was dangerous and could murder his friend. The ramifications of that failure would impact his place as a leader and trusted ally on the Destiny. Young took the risk because he believed that saving his friend was the right move. That doesn’t mean he feels great about it. His cold manner with Scott shows that Young is still dealing with his brutal move. Telford’s first words as a free man warn of the Alliance invasion. It gives Young no chance to recover and immediately shifts to the next crisis. When he sees Telford in the gate room, he flinches and believes he’s saving Rush. It’s a normal human response from a guy who regularly pushes back his emotions. Young is a flawed military commander, but this error comes because his humanity won’t allow him to sacrifice one of his people. Young’s decision also shows the difference between him and Kiva. She killed her scientist in “Subversion” solely to prove her mettle with Rush. Young is trying to protect his people and is battling on too many fronts. Kiva has a singular mission and won’t flinch when tough choices are necessary. Logic can sway her decisions, however. Telford knows that he can save crew members like T.J. through their value to the mission. 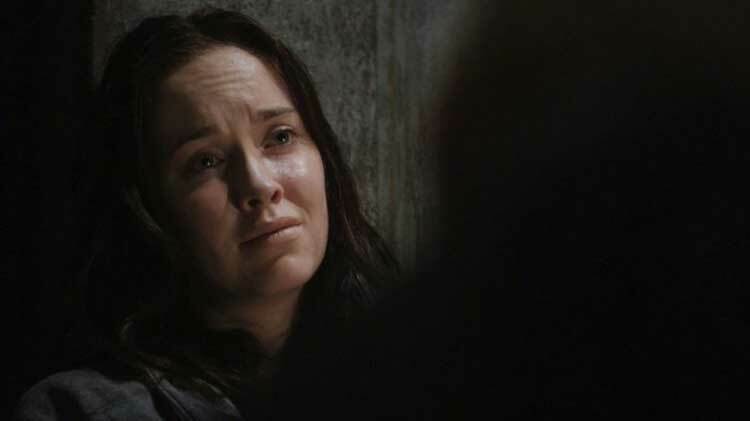 Rush understands what’s needed to defeat her because of his experiences as Kiva’s prisoner. When he talks about acceptable losses, it isn’t just to belittle Young. Rush has a valid point about how to defeat such a determined enemy. Young may vehemently claim that he’ll save everyone, but that level of success is impossible. There’s one more layer to Young’s choice not to vent the atmosphere: it wouldn’t work from a TV perspective. Creatively, it’s a brilliant stroke to create doubts about the leader’s actions. It adds weight to every casualty on their side from this fight. They aren’t Young’s fault directly, but everything ties to his first choice. It’s another way that SGU reminds us that we aren’t watching super heroes. Both sides make mistakes and inadvertently harm people in the process. Kiva executes Rivers (Zak Santiago) without hesitating, but it does not come without a provocation. Introducing more complexities is what makes this episode rise above the typical shootout. 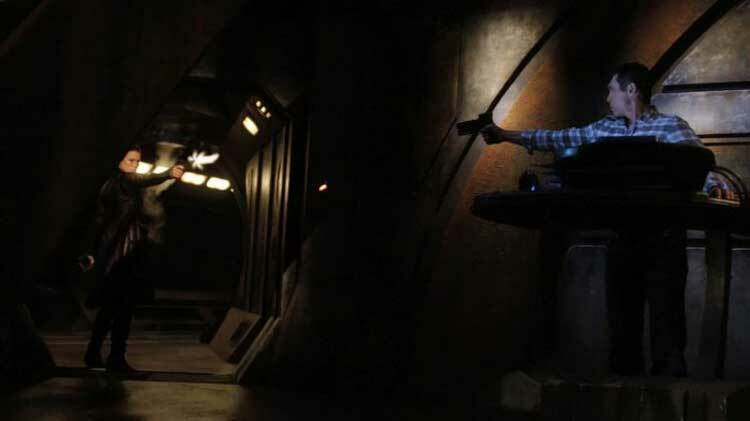 “Incursion” also represents a final hand-off between the original SG-1 characters and the new group. 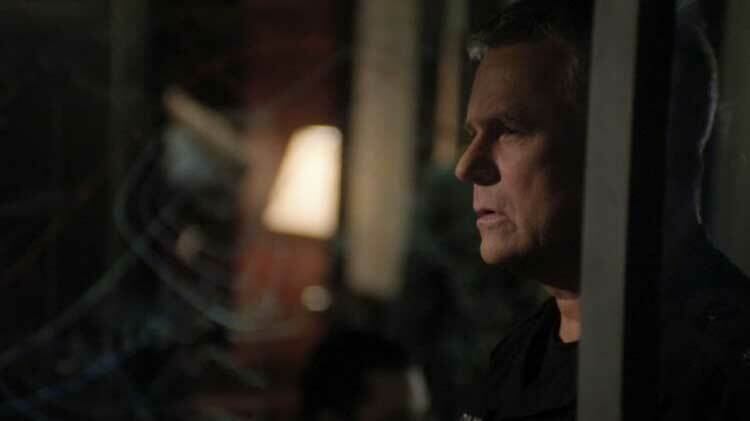 Richard Dean Anderson, Amanda Tapping, and Michael Shanks all make their final appearances on SGU. Shanks’ Daniel Jackson only appears on a reprise of the video from “Air” that Eli watched at the start of his journey. It’s cool to see one last scene between Anderson and Tapping as Jack O’Neill and Samantha Carter. It’s only by video screen yet still reminds us of their chemistry. It’s a brief moment but includes a nice touch for long-time fans. Carter lost several F-302s when the Icarus planet exploded, and O’Neill calls her “Sam” when offering condolences. This is a rare informal comment on the job even for such a close pair. The standout moment comes from O’Neill when he dresses down an uncertain Young. He supports Rush’s point that Young should have vented the atmosphere. O’Neill’s frustrated reaction reminds us that Young is fallible and may lose this fight with the Alliance. Anderson sells the moment by playing it straight and directly questioning Young’s readiness. This kick in the pants is the final scene from an SG-1 character on SGU. The old guard is telling this new crew to stop wallowing and take charge. It’s a call to action for Young and even the show itself. It’s up to this talented group of actors to take the next step and keep pushing the needle. Two of the series’ main characters spend most of the episodes totally separated from the others. Placing Eli and Chloe apart from the action is an interesting way to step away for a moment. She has been shot and their air is limited, so it’s hardly a carefree adventure. Even so, there is a lighter feeling to the interludes with this pair than on the main story. Despite some great work from David Blue, the Scott/Chloe/Eli love triangle didn’t always click. It felt a little too predictable for a show that was trying to dig deeper. Even so, the scenes where Eli and Chloe discuss their friendship are quite moving. Calling a guy with a crush on you an “amazing friend” is typically a backhanded compliment, but Chloe’s eyes say a lot more. Without having to make a big confession, he’s able to let go of the burden and just focus on the task at hand. From a story perspective, moving Eli and Chloe away serves three purposes. 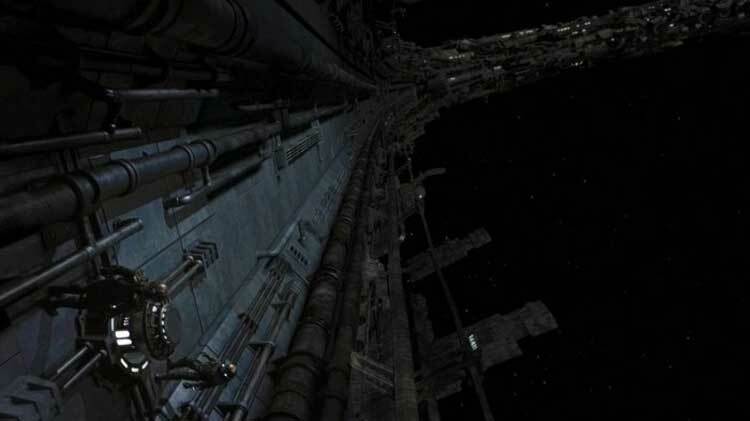 For the plot of part two, it offers another chance to Greer and Scott when they’re trapped outside the ship. Beyond that purpose, the decision ratchets down the constant tension. It’s refreshing to switch back to Eli and Chloe after experiencing the tense Young/Kiva showdown. Looking to season two, this plot also reminds us of the scale of the Destiny. There are so many unexplored areas on the ship for characters to uncover next season. These moments set the stage for a lot more efforts to grasp the Destiny’s mission and its secrets in the upcoming episodes. This episode gives many characters beyond Young, Eli, and Rush the chance to stand out and help the cause. T.J. remains poised after being taken hostage even when Kiva is ready to kill her. She also shows off her improved medical skills while patching up Varro. He may be the enemy but still gets the same type of treatment from T.J. The seeds are set for a future relationship with Varro, but that’s far down the road. Right now, she’s facing a difficult and stressful circumstance while being pregnant. It’s a situation that would cripple most people, but T.J. doesn’t blink. She’s one of the crew’s most important members and proves it consistently during the crisis. Alaina Huffman’s quiet performance as T.J. deserves serious credit for anchoring the show. Lou Diamond Phillips also gets the chance to shine as Telford, who’s been a one-dimensional jerk for most of the season. Once he starts working behind the scenes to stop the Alliance, it’s easy to see why Telford was worth saving. Phillips brings such humanity to a guy trying to make up for his horrible behavior. The fact that Young trusts his old friend after everything shows the solid guy he was before the brainwashing. Telford’s quick thinking saves T.J. while keeping him believable to Kiva. She’s no dummy, so the fact that Telford avoids getting caught for a while shows his mettle. This invasion is also a clever way to get Telford physically on the Destiny. 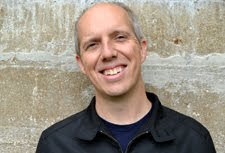 The series is better with Phillips taking a more prominent role. “Incursion” also spotlights the underrated work of Ming-Na as Camile Wray. The writers haven’t always known what to do with her; they’re more comfortable with military characters. This conflict gives Wray a chance to stand out and negotiate with Kiva. She remains brave when exchanging prisoners in part two. We also see an evolution in Wray’s relationship with Young. He surprisingly agrees with her position on negotiations and gives a nice gesture in sending the flak jacket. There’s warmth in that scene when Scott communicates the message, and that connection has been missing for much of the season. Wray should have more chances to stand out in the second season. 1. Young and the military are rounded up and about to be executed. 2. Scott and Greer are stuck out in space with a binary pulsar on the way. They’re running desperately for a separate entrance on the other side of the ship. 3. Eli is racing to meet Scott and Greer inside the Destiny and open the door for them. 4. Chloe has been shot and closes her eyes, which hints that she may be dead. 5. Kiva catches Telford subverting their plans, and they shoot each other. Both are in critical condition yet seem to be alive, but their prognosis is unknown. 6. A shootout erupts in the medical bay, and T.J. is shot in the stomach by a stray bullet. Her life and the life of her unborn child hang in the balance. Beyond these specific moments, there’s also the larger question of whether anyone on the Destiny will survive the battle with the Alliance. They’ve lost most of their leverage, and Kiva's injury has enraged the remaining enemies. We also don’t know if the Destiny will escape the binary pulsar. Rush and the other scientists still need to fix the FTL, and the Alliance has captured them. These cliffhangers are good because they don’t cheat the fans with a shocking twist. We’re just taking a break in the midst of a tense showdown. It was hard to wait three months for the next episode. Even so, it generates excitement for the next season. It’s fitting that “Incursion” concludes with a shot of Young’s hopeless face. He looks up to the sky and prepares to meet his fate. All of the questions about Young’s decisions that I addressed earlier are surely going through his head at this awful moment. The close-up view of utter defeat is a feeling that we haven’t seen from Young. He’s had doubts but has never been so despondent about what’s coming. SGU frequently reminds us that even the best intentions can lead to failure. Young is human and could have acted differently, but it’s easy to say that in hindsight. He can only hope that a last-minute save is on the horizon. Knowing how things work in genre TV, the audience realizes there’s always a chance. That glimmer of hope is missing from Young’s face, though. He’s ready to meet his maker in a matter of seconds. 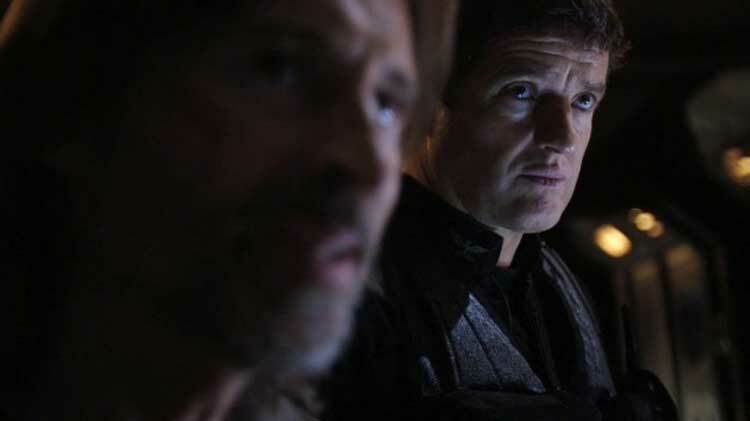 This article is the final part of Season One of the Reconsidering Stargate Universe series, which takes an up-close look at each SGU episode. Catch up with all the entries on this page. Trivia: Incursion was originally planned as a single episode, but as I started writing off the very dense outline, I realized there was no way I was going to be able to contain all the action in a single episode. Thanks! I can't even imagine how you could fit this entire story into one episode. It moves so quickly through two episodes (plus the S2 premiere), and doesn't have any padding. I'm glad you were able to split the action into two episodes. I really appreciate the comment; it means a lot and I'm glad you enjoyed it! If there were awards for fan wrote appraisals of tv shows, i feel you should definitely be in the running to win!!! There should be! As always, I really appreciate the kind words.